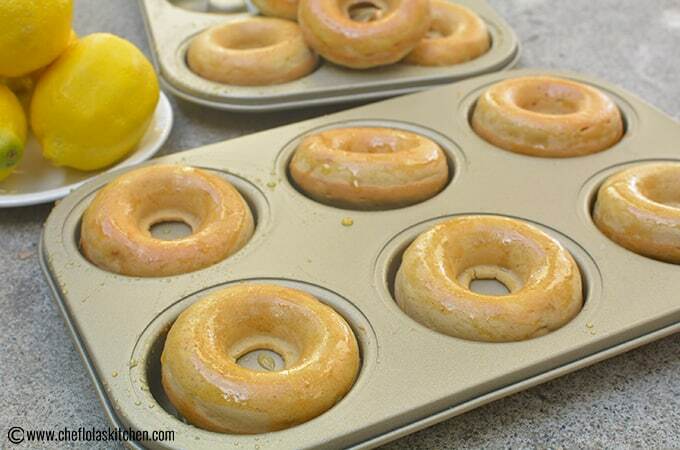 This baked donut recipe requires just a few ingredients and it takes a few minutes to put together. All you need to achieve a nice baked donut is a doughnut pan, a mixing bowl, a hand whisk and simple ingredients like the All purpose flour (obviously), Sugar (I used brown cane sugar. 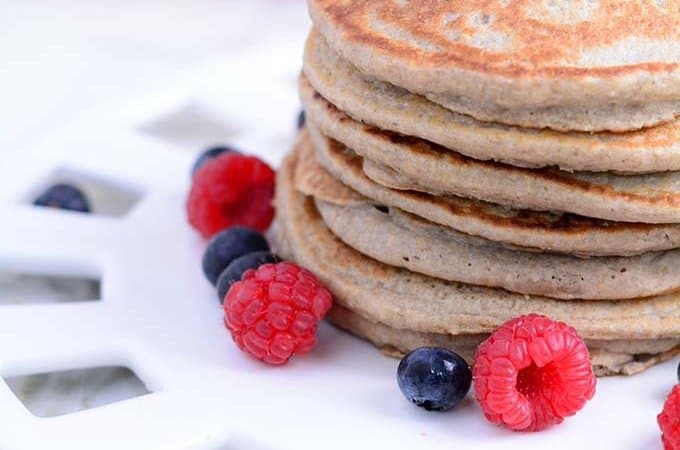 Any sugar will work) and other simple ingredients you are likely going to have in your pantry. 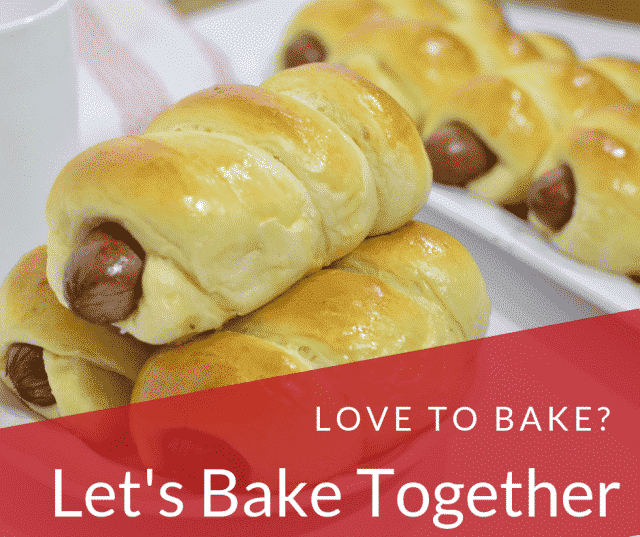 I know many of you have been asking me for the longest time for this recipe. I’m sorry it came in a little bit late, but, no better time than the present so let’s get baking! First things first, preheat using a pastry brush, I’ll start by greasing my doughnut pan, with a little bit of butter and set it aside. 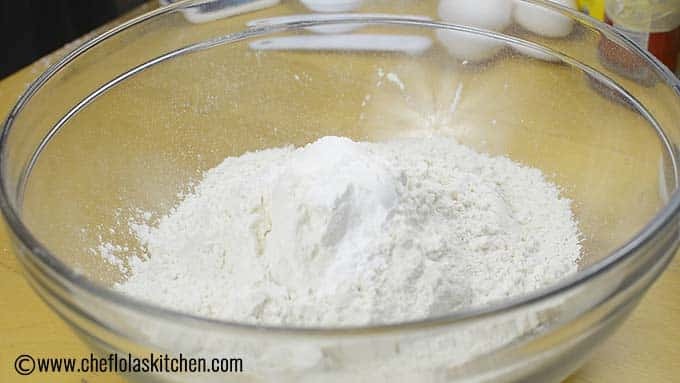 Measure out the all-purpose flour in large bowl. 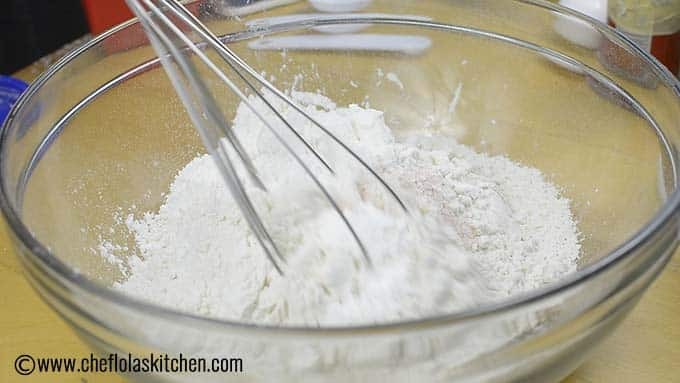 It’s noteworthy that, when measuring out the Flour, the measuring cup should be leveled not heaped. 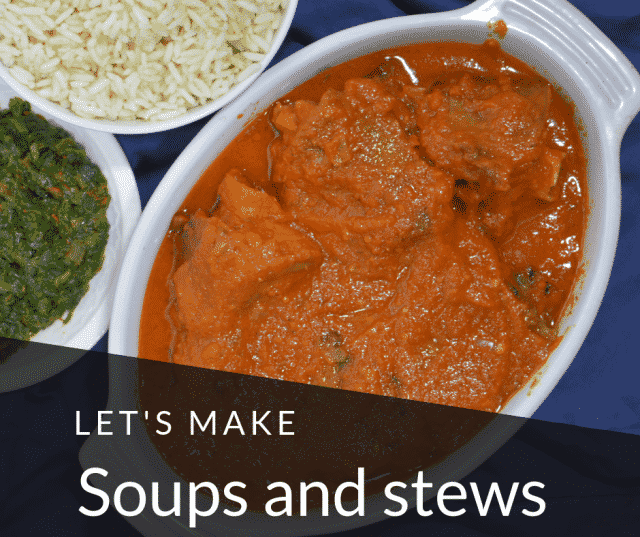 If you are used to the metric measuring system, then you can check out the conversion in the recipe box below. Add the baking powder and a little bit of salt and some cornstarch. 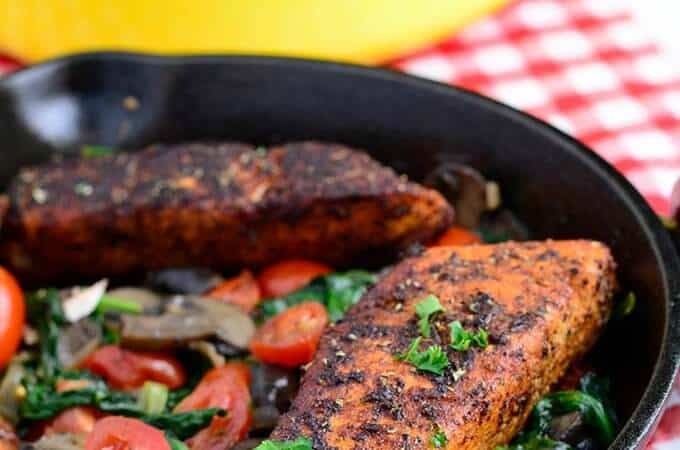 You may be wondering why is cornstarch added in this recipe? or better still, why is cornstarch added during baking? I know a lot of people know that Cornstarch is known to be used to thicken up sauces right? 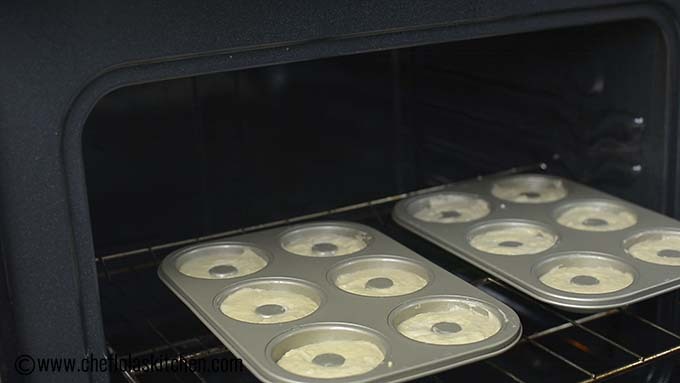 It is also used to soften the protein in all-purpose flour which will make your baked goods more tender. Give the ingredients a good whisk and set it aside. 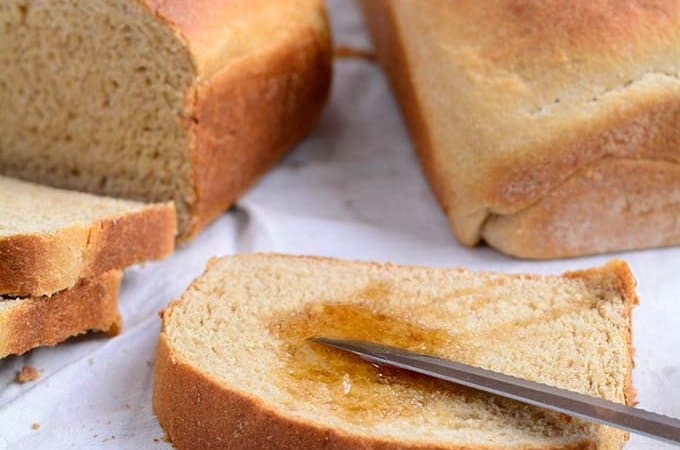 In a separate bowl, cream butter, and the brown sugar until it becomes creamy. Once the mixture is creamy, it’s time now to add our spices – I used cinnamon and nutmeg which gave my doughnut a bold but not overpowering taste. However, you can use either one. 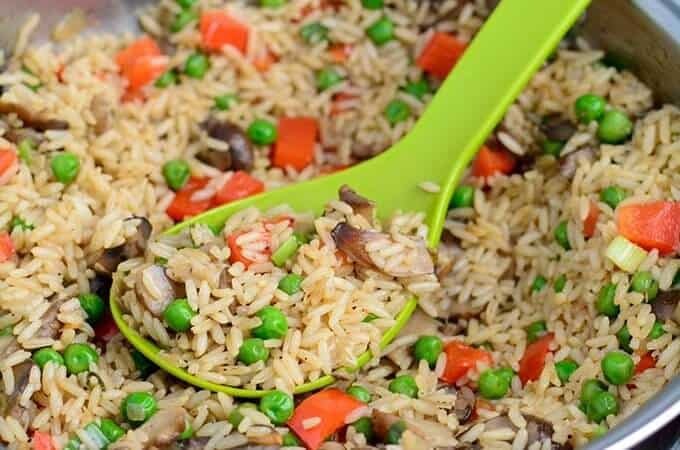 Don’t forget to scrape down the sides of the bowl so that everything can be well combined. When everything comes together perfectly, it’s time to add the eggs one at a time beating the mixture after each addition until it is well absorbed by the mixture. Add the dry ingredients together with the wet ingredients together alternating between the Flour and the Milk starting with the flour and ending with the flour. Mix everything together very well until it’s perfectly combined. 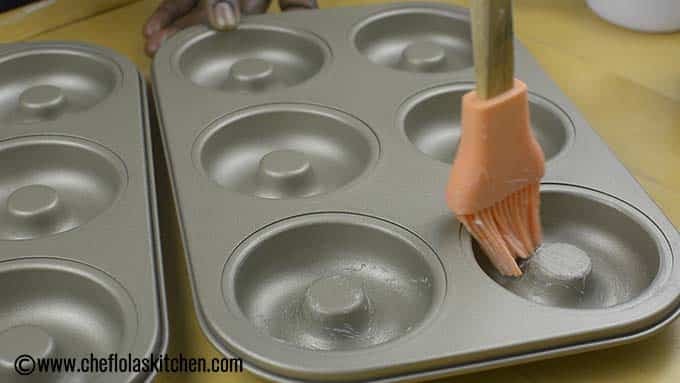 Place the piping bag inside a cup then scoop the batter into the piping bag. Don’t fill the bag to the brim, some allowance should be given at the end where you can hold the bag. 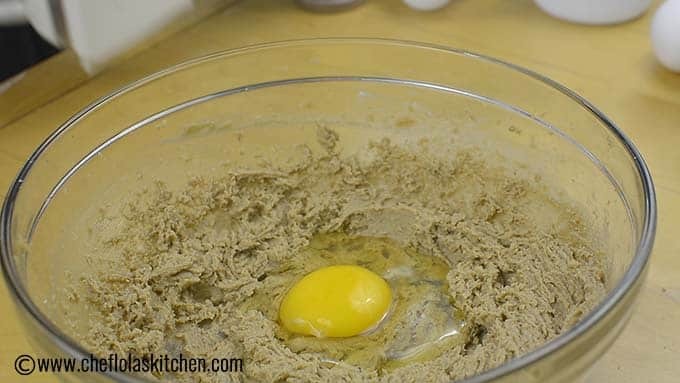 Cut out the tip then squeeze the batter into the prepared pan. Again, don’t overfill the pan, about 3/4 way to the top is fine. This will give enough space for the doughnut to rise. Place in the oven and bake for about 12 to 15 minutes. When this is done it’s only the underside that will turn out golden. If you want the top to brown a little, it’s okay to flip to other side (if you want to). This extra step is optional but I like to do it anyway because it makes it look good! Apparently, it has nothing to do with the texture or taste. I also want you to know this. Sometimes, the baked donuts tend to have a mind of their own. They may not want to get browned on the flip side. If this happens to you, don’t push it. I mean don’t be tempted to over bake the donuts otherwise your doughnuts will dry out in the oven and turn out hard. 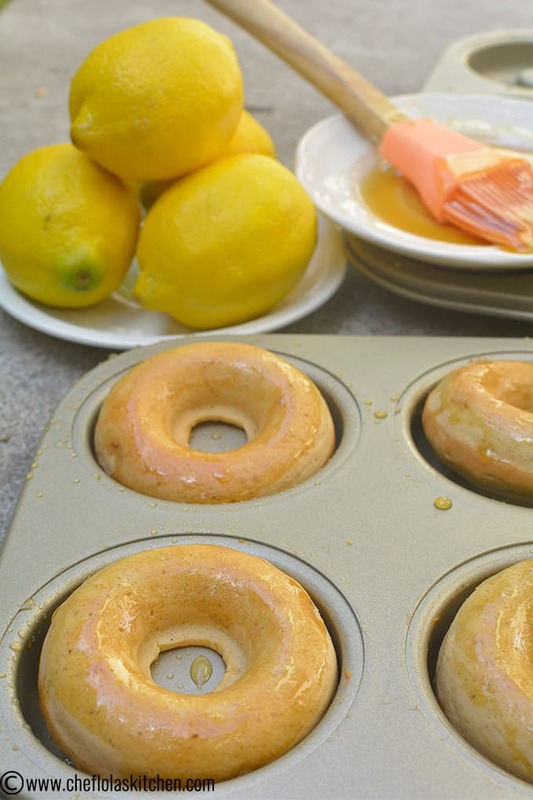 Glaze with the honey lemon glaze and Enjoy! I used honey and a tiny bit of lemon and yes everyone could not have enough of it. You can go all out to experiment and use any glaze of your choice and you can also finish up with sprinkles if you’d like to. 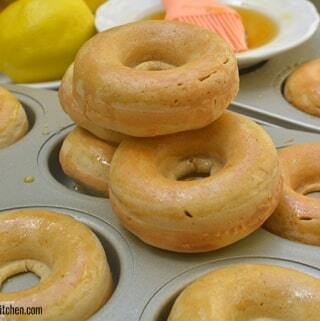 You can also involve the kids in making this yummy baked donuts, they will have fun putting it together. This Honey glazed No Yeast baked donut is very delicious and easy to make. It's moist and warm on the inside and it tastes absolutely delicious. The classic doughnut I grew up with is the old-fashioned yeast-raised. Preheat your oven to 350F. 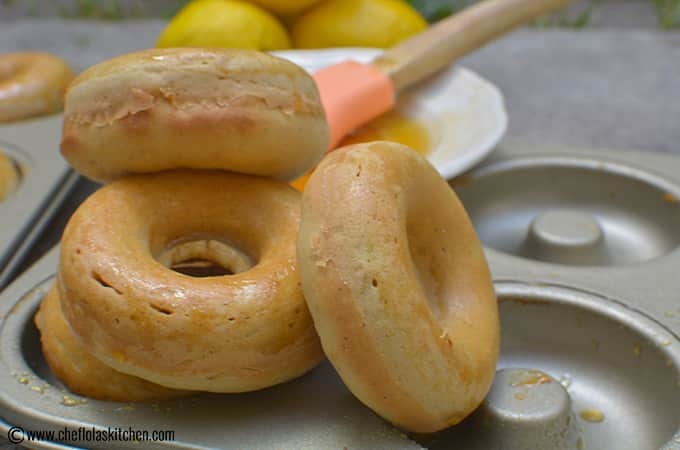 Then Grease two donut pans and set them aside. 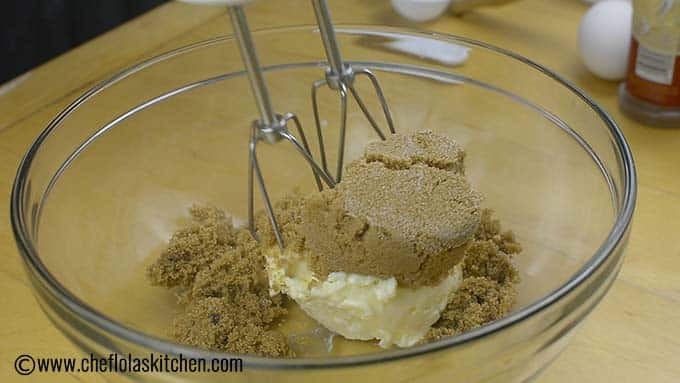 In another Bowl, whisk together the Butter and the Brown sugar until it becomes creamy. Add the cinnamon and nutmeg and whisk. Add the Eggs one at a time whisking each egg until it is well absorbed by the cream. 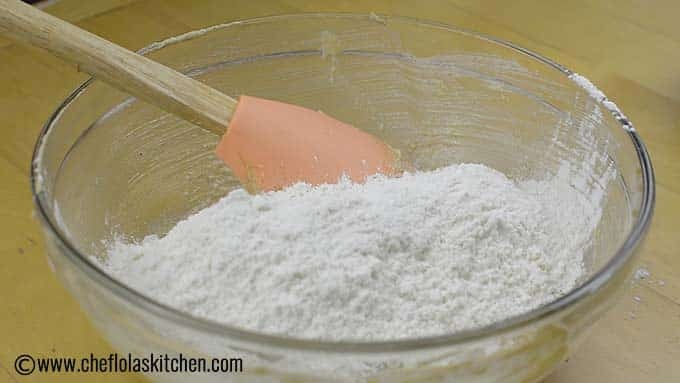 Add the flour and Milk alternately: Start by folding some flour into the cream flour into the cream then add the milk and fold until the milk has been absorbed by the batter. Repeat this process again making sure the flour comes last. Fill the piping bag with the donut batter leaving some allowance at the end where you can hold the bag. 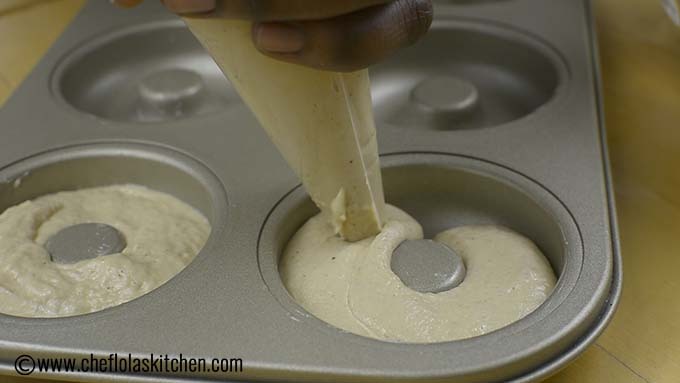 Then, squeeze the batter inside the donut pan about 3/4 full. place in a 35o F oven and bake for 12 to 15 minutes until the flip side becomes golden brown. 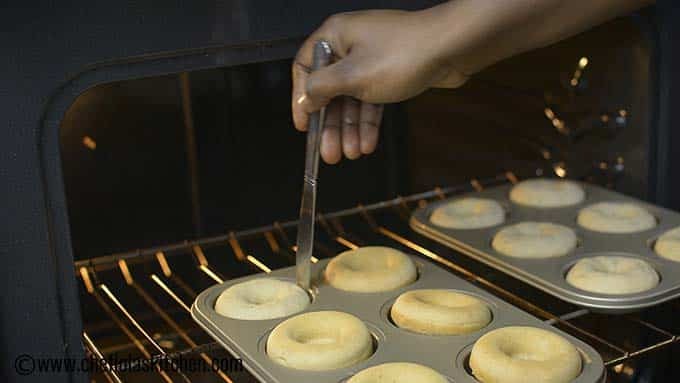 The baked donut is ready at this point, however, if you will like to brown the other side of the donut, simply flip it and leave it to bake for another 3 to 5 minutes. Glaze with the honey lemon glaze or any other glaze of your choice. Hello ma, pls should I use a evaporated milk? Yes, Fanna you can but sure to dilute it a bit before using it. Hi Lola. I really appreciate the video on on the baked doughnuts. Please I want to know how long the baked doughnuts can last. Thanks. Hi Bukie, it will last for a day…Its shelf life is just like the yeast doughnuts. The texture will change on the second day and will not be as fresh again.